When it comes to deciding what’s right for you, there can only be one answer: Incognito. Only Incognito will allow you to enjoy invisible braces—since they’re attached to the inside surface of your teeth, it´s impossible for anyone but your orthodontist to see them. Their aesthetic value makes Incognito the #1 choice for many adults who don’t want their treatment to interfere with living a normal life and smiling with confidence. When compared to traditional braces, Incognito represents the next generation of orthodontics technology. State-of-the-art technologies including Computer-Aided Design, Computer-Aided Manufacturing, Rapid Prototyping, and Robotics make this treatment model one of the smartest you’ll find available. 100% customized to your mouth, Incognito is the only invisible fixed orthodontics appliance system on the market. The Incognito appliance ensures efficient, effective treatment outcomes every time. 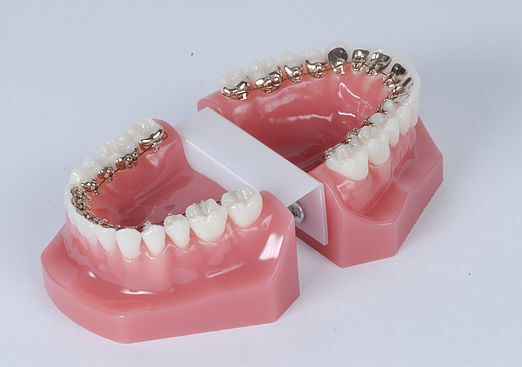 Fully customized brackets, bonding trays, and archwires are all part of a process that achieves beautiful results. Because the wires are customized, they don’t have to be adjusted periodically like traditional braces. That means fewer appointments and less discomfort for you. Every treatment experience is predictable and convenient, but even more important, treatment results are reliable. Because of the customized nature of treatment, it will not take long for you to start seeing a difference. Incognito’s special features make it the preferred treatment for adult patients at Yardley Ortho. Designed to meet the growing need for invisible, comfortable, convenient orthodontic care, Incognito is for anyone who prefers a customized approach to straightening their teeth. When it comes to orthodontic treatment, we understand that one size does NOT fit all. By offering a custom fit for each patient’s prescription, Incognito has become an effective treatment for patients across a wide range of orthodontic cases. If you’d like to keep up a professional appearance without the unsightly look of metal braces, Incognito may be an excellent option. Musicians who play wind instruments (involving the mouth), as well as athletes, have found Incognito treatment to be safer and more convenient to their specific situation. Or, you might be someone who has tried another treatment such as Invisalign but were unable to complete the treatment. If you don’t like the idea of plastic aligners in your mouth or don’t want to go to the orthodontist for periodic adjustment, Incognito is your solution. Since they aren’t removable like Invisalign you don’t have to worry about losing your aligners. And best of all, they’re invisible! You can talk to your dentist about whether Incognito could be right for you by getting an appointment at our office, calling 215-968-5471, or fill out the form below and we will contact you as soon as possible.